EDIT 8/16/2010: This post was written on 3/22/2010, during the Starcraft II beta. Since then, the numbers have slightly changed, but the overall strategy is unaffected. Okay, so how does one build a Void Ray? Well, it’s at the same tech position as the Scout in the original StarCraft, and is available immediately upon completion of a Stargate. Its cost (200/150 in beta, now 250/150) is overall similar that of an old Scout (275/125). But it is significantly stronger, especially in air-to-ground. Because it deals damage faster the longer it attacks, the Void Ray is best used against large units—capital ships and buildings. Carefully controlled, however, the Void Ray can be powerful against smaller units as well, if it charges its attack to level three first on a larger unit. This means the Void Ray should be a very micro-intensive unit. You’ll have to constantly choose the right targets to attack. Interestingly enough, Void Rays are most potent in this skirmish, for two reasons. 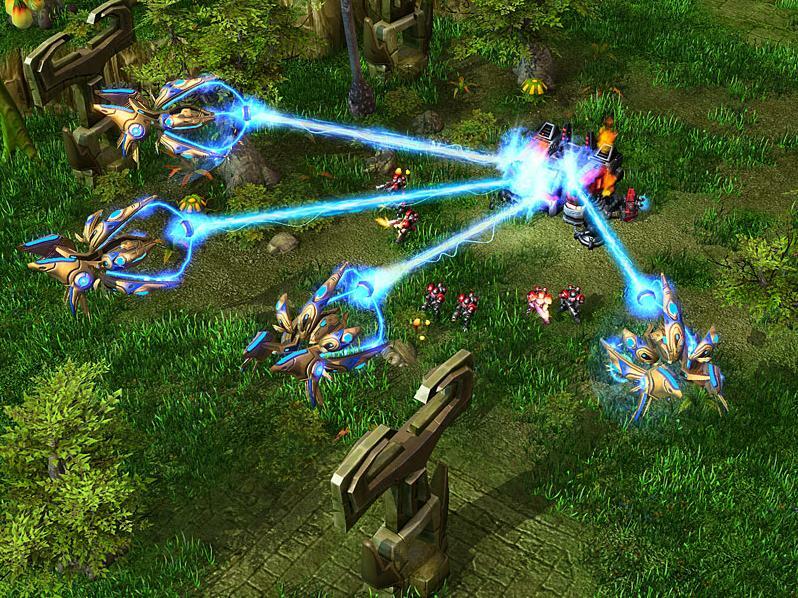 One, most Protoss units are huge anyway, so the Void Ray does not waste much firepower. And secondly, Protoss do not have great anti-air defense with just early ground units. In fact, one cheesy but potentially deadly strategy is to rush a Void Ray at the enemy Nexus. If your opponent is caught off-guard, you win. Sure, a couple of Stalkers will easily overpower a Void Ray, but if the enemy is massing Zealots and/or Photon Cannons, then the Void Ray works. Photon Cannons will beat Void Rays, but a Void Ray can simply go around the Cannons or, if the enemy is not careful with Pylon placement, it can destroy the Pylon powering the Cannons. If you want to execute this rush, you’ll need some type of base defense early: a few Zealots and Photon Cannons (try to avoid Sentries as they consume a lot of gas that the Stargate/Void Ray will need), and maybe a couple Stalkers will do. If possible, place the Photon Cannons strategically as to damage an attacking ground force before it enters your base. Zealots should block the ramp (assuming there is a choke). This way, any attacking force of Zealots will be destroyed by ranged attacks, while a more mixed force should suffer a disadvantage due to the strength of Photon Cannons and possibly the high ground. To do this Void Ray rush, it is necessary to scout the opponent and at the same time try to prevent his ability to scout you. Scouting is the key to this strategy. When the enemy Probe gets in your base early, send a Probe right away to chase it. When you have Zealots, block the choke. (Or defend it with Cannons.) For your own scouting, since gas is going to be the more important resource, it would not hurt to warp in a Pylon or Assimilator inside the enemy base, just so you know what’s going on for a longer amount of time. Building Assimilators in the enemy base is even stronger for the Void Ray rush: you at least delay your opponent’s ability to gather gas. And if you delay your opponent’s gas, you also delay his ability to build Stalkers or Stargates. Okay, what if the enemy has Stalkers when your Void Ray arrives? Then your rush will appear to be a failure. If there’s just one Stalker, it might be possible to begin charging up on the Nexus, as the fully charged Void Ray should be able to take out a Stalker. But if he has multiple, your best bet is to pull back the Void Ray. At this point you have two options: play normally with a slightly higher tech but weaker economy, or continue on this air rush with the Mothership. What? How can the words “rush” and “Mothership” be in the same sentence? Well, perhaps it’s not a rush, but you’ll want to get a Mothership as soon as possible after the first Void Ray. A Fleet Beacon should come very quickly. You can use the Void Ray to scout the map. While the Mothership is building, construct another Stargate and another Void Ray. I had a game where my opponent, upon seeing my first Void Ray, tried to catch up to Void Rays as well, but it’s quite mathematically known that Mothership + Void Rays > Void Rays. With a strike force of a Mothership and two Void Rays, you should be able to demolish your enemy’s Nexus, shooting down things that get in the way. Economically, you will probably have an excess of minerals while warping in the Mothership; that is a good time to expand. And make sure you fortify it with a few Photon Cannons. Warp Gates are very helpful for defense as well. This is slightly more difficult; you’ll have to worry about an early-game Marine + Marauder attack. Or, even the Marine + SCV rush, which has recently surging success. To really survive against this, you’ll need a lot of Zealots and a lot of Cannons. Massing Cannons is extremely productive. Also, you’ll probably want to go with a Void Ray + Carrier + Mothership attack rather than just Void Rays. However, you’ll want to obtain an early Void Ray anyway to possibly harass your opponent’s economy and/or expansions. Just be careful: If your attack is too slow, your opponent’s Scanner Sweep can pick up on your aerial intentions. If possible, do a lot of teching. Upgrades, especially in weapons, will help. If map space allows, you can even consider moving your main air force out of your main base, just so a Scanner Sweep won’t get vital information. Warp Rays, the old Void Rays. Picture by Blizzard. A mixed aerial assault should work. Go for the enemy main base—you’ll want to take out as much economic and production infrastructure as possible. And don’t attack through the main entrance; hit the base from behind or from the side. Again, the Void Rays should be able to take out the Command Center, while the Carriers and Mothership deal with defenders. If you don’t like the idea of an air-only attack, bring in a Warp Prism and warp in ground units from Warp Gates. Stalkers will normally be most useful. For example, in one game I had a Mothership, two Carriers, and two Void Rays—in total, a very small force. My opponent had a much larger ground army of Marines, Marauders, Hellions, Tanks, and Vikings. After he began an unstoppable attack on my expansion, I sent the air force into his main base. Even though my opponent managed to wipe out my expansion completely, he resigned because his main base was indefensible. I had a Warp Prism with me and warped in 7 Stalkers into the enemy base as well. The one unit you really need to watch out for are Vikings. If your opponent masses Vikings (in large numbers these are extremely good against Protoss air), then you’ll need to respond with a lot of Phoenix. They really don’t do that much damage against Vikings, but you’ll like their capability to act as shields for the rest of your air force—a Viking needs 9 attacks to kill a Phoenix, and to kill a Void Ray, a Viking will need… 10 attacks. So a Phoenix will take nearly as much time to kill as a Void Ray. Phoenix are also fast, and can chase enemy Vikings that run. If the enemy goes Battlecruisers, well, Void Rays counter those. Definitely watch out for Ghosts. The Mothership is especially weak to EMP—it instantly loses half its total health. I’m not really sure how to counter this; just make sure weapons and armor are upgraded sufficiently. If you can spot the Ghost, a Phoenix’s Graviton Beam should disable it and allow other Phoenix to kill it. I have the least experience in this type of matchup, so please excuse my mostly theorycrafting here. Overall, Void Rays don’t work as well against Zerg, due to the defensive anti-air capabilities of the Zerg Queen. Plus, most Zerg units are small, and hence Protoss ground armies work better. For air superiority, especially against Mutalisk, you’ll want to build a fair number of Phoenix. If you have about 2/3 as many Phoenix as your opponent has Mutalisk, you’ll do well. For the sake of numerical comparison: A Mutalisk needs 20 attacks to destroy a Phoenix, whereas a Phoenix needs only 6 to kill a Mutalisk. Phoenix cost more (150/100 versus 100/100) and take more time to build, so having fewer in numbers is fine. Besides, Phoenix are faster than Mutalisk. Having Void Rays can help nonetheless—they can be powerful raiders as well as Overlord hunters. Plus, they can lure the enemy to send a lot of Mutalisk, providing bait for your Phoenix. Against Zerg ground-based anti-air, however, you would be at a loss. You’ll probably need a ground-based army as well. I haven’t really tested the strength of a Mothership + Carriers + Void Rays + Phoenix army against a Zerg defense force of Mutalisk + Corruptors + Hydralisk, but it seems that mass Hydralisk will nevertheless win. Actually, just thought of this. If you do have air superiority, you can still win with a Phoenix + Void Ray combo—the Phoenix can use Graviton Beam on the Queen, allowing the Void Ray to destroy it and/or the Hatchery structure. So, looks like Void Ray structure demolishing is back on. Edit: It turns out the Void Ray is just as effective against Zerg. My strategy is to fake an early Zealot push so that your opponent builds lots of Roaches, while using a proxy Stargate to pump out Void Rays. Make sure to keep the first Void Ray back and only attack once you have two Void Rays. This is to destroy the Queen. At this point, you’ve either won immediately, or will meet resistance in the form of Hydralisks. If so, build a Fleet Beacon immediately (!) and get a Carrier and a Mothership. I would throw in an air attack upgrade as well, since you have the Cybernetics Core. Meanwhile, you’ll have built another 2-3 Void Rays, so your air army will consist of 4-5 Void Rays, a Carrier, and a Mothership. Keep everything in the Mothership’s cloaking field, and try to fight on the edge of a cliff, so that if your opponent sends Hydras, you can just pull back the Mothership and have the Carrier and Void Rays continue decimating the Hydras. Because the air force is very gas-heavy, you’ll probably have a lot of spare minerals, so build a Zealot army that can check expansions. Micro the Mothership and Void Rays carefully enough, and you’ll eventually be wiping out entire armies without losing a single unit. The Carrier is there really for intimidation and confusion. The counter the Mothership is the Corruptor, so a small number of Phoenix should be built as soon as your opponent realizes you have a Mothership. Or you could go with extra Carriers.